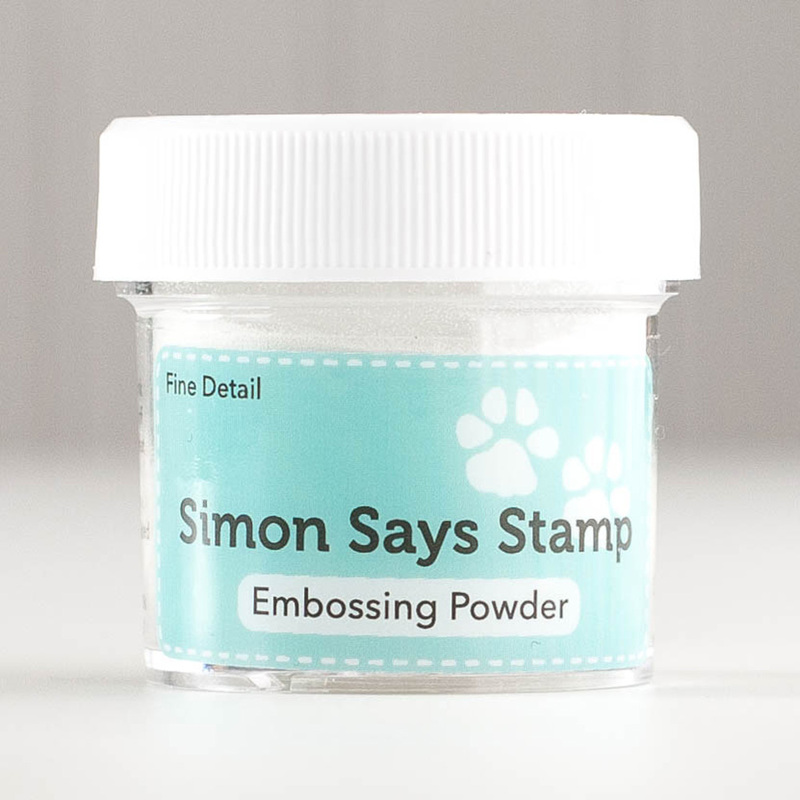 Simon Says Stamp Challenge – Going Dotty! Second post for today! My first post is HERE! This week the challenge is Going Dotty! 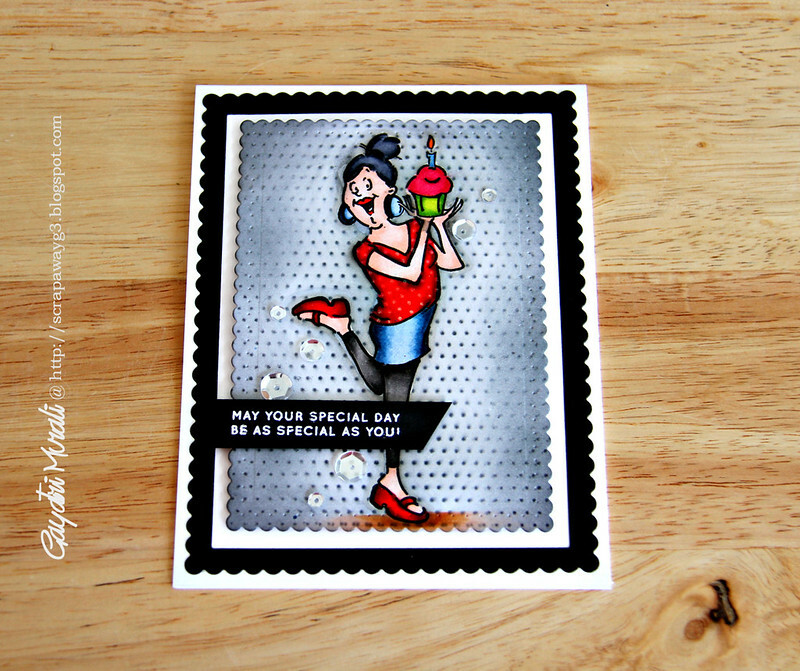 Here is my take on the Getting Dotty Challenge using Art Impressions stamp. I started with stamping the image from Art Impressions called Cupcake Bff’s and coloured with copic markers. I must tell you that I really enjoyed colouring this image. Made me smile a lot. I then covered the image with rubber cement and left it to dry. The image is now masked. I then placed the Tiny Dots Stencil from Simon Says Stamp over the image and sponged Black Soot Distress ink. I removed the rubber cement from the image by just rubbing my fingers over the image. The inner panel is die cut using Winnie & Walter’s Essential: Audrey Cutaway. I sponged Soft Granite ink to the edges of the panel. Love the scallop edge. The black frame is die cut using Mama Elephant Femme frame die. To assemble the card, I make a white card base, then adhered the black frame using liquid glue, then the stamped panel using foam adhesives. The sentiment is from Simon Says Stamp Birthday Messages stamp set which I had white embossed on black cardstock, I then trimmed the cardstock and adhered using foam adhesive. Finally I have used Sparkling Clear sequins from Pretty Pink Posh. I have brushed Pink Wink of Stella on the cupcake. Here is a closeup of my card. Fabulous card Gayatri! Love that cute image! Amazing coloring!! 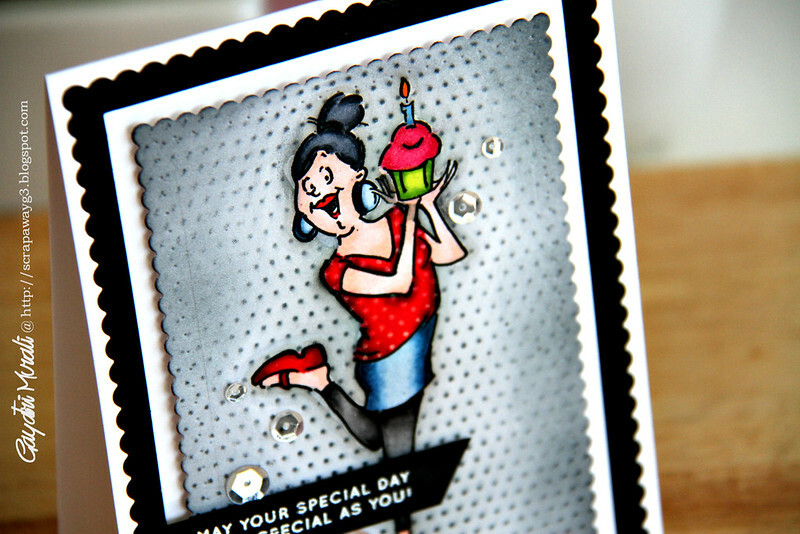 A fabulous card Gayatri, gorgeous colouring of the adorable image and super design and colouring!! beautiful card Gayatri!! love it!! Great card for the challenge this week, Gayatri – love the bright colors! I love your coloring…so beautiful! hello Gayatri! this is precious, luv the darker polka dotted background…so fun! hope you have a wonderful weekend! I love the striking color combination you used here, so vibrant and appealing. The scalloped frames sets everything off so nicely.